​​​​​Looking for a repair show you can trust? Look no further! We're the most fair, honest auto repair shop in the area. From head gasket to tailpipe, we've got you covered. We use the latest diagnostic technology to provide high-quality service and quick turnaround. 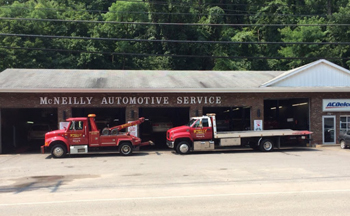 We install a wide variety of tires on any vehicle and perform alignments. While we stock a regular set of tires we can order any brand you want. Come to us for a variety of automotive services ranging from basic maintenance to heavy repair. With competitive rates and fast service, we’ll give you the best value for your time and money. ​"These guys are the fairest, most honest, and most reliable automotive specialists I have ever dealt with and I refuse to take my car anywhere else!" "I've found them to always be very honest and charge reasonable amounts. I took a vehicle in for inspection and they recommended that I just get rid of the car as the repairs were much more expensive than the vehicle.I've also had a minivan and a different car serviced there several times and been very satisfied."